Is who to contact a bit iffy? This page'll resolve that in a jiffy! Please note: Answers to many questions can be found in the FAQ's & Formulas section of my web site, including science fair project ideas, additional informative web sites, book suggestions and home-made recipes. 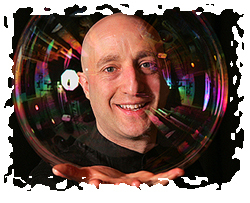 To answer questions about whether Bubblemania! is available in your location please check the contact information below. Show Length: 20, 30 or 60 minutes. North East, Nationally and Internationally. Artistic or Science Presentations, with or without Comedy; Verbal or Non-Verbal. To make performance booking arrangements with Casey Carle please contact Todd below. Bubblemania! performed in central and western New York state & northern Pennysylvania. 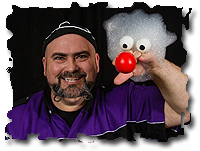 [Program Info] Contact Jim for BubbleMania Jr! 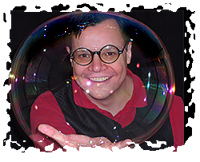 Mr. Jim's funny and educational BubbleMania Jr! presentations are available exclusively for events catering primarily to children 3-5 years of age and their caretakers. BubbleMania Jr! is performed by Jim in Southern New England, NYC, Long Island, Northern NJ.